Tales of angels have existed for millennia, but it’s probably fair to say that none have ever been quite like this week’s Anime of the Past. Haibane Renmei is a thirteen-episode television series that originally aired in 2002. 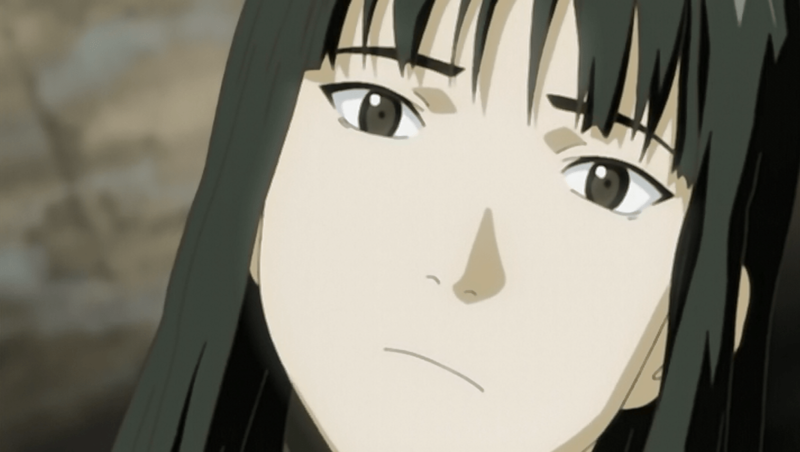 The series is based on a short-lived doujinshi manga created by the show’s writer, Yoshitoshi ABe, the character designer of Serial Experiments Lain. The Haibane may gain wings and halos, but acquiring them is far from Heaven. After an agonizing first night, in which Rakka suffers from a fever as her wings tear out of her back, she is introduced to the strange new world around her and its even stranger rules. For example, Haibane live within the walled city of Glie and coexist with a population of humans, but neither Haibane nor human is allowed to ever venture outside of the city’s walls, much less touch them. Haibane are also not allowed to own new clothes, nor live in new homes, and must instead wear consigned clothing and live in buildings that humans have abandoned. Haibane are also expected to work, but are not allowed to handle money. When they make purchases, their payments are represented by notebook pages that they must exchange for the desired goods. Overseeing the Haibane are the Haibane Renmei, a sort of elder council that provides advice and guidance to Haibane that require it. 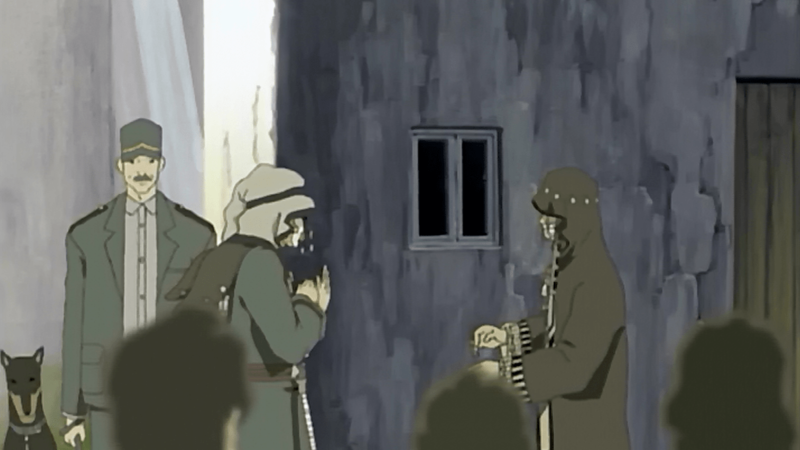 The Haibane Renmei are also the only ones that are allowed to have contact with the Toga; the only beings allowed to leave the city, and who return with goods to sell to Glie’s residents. Rakka is first introduced to the Communicator, the Haibane Renmei whose duty it is to speak with the Toga, when she arrives at the temple to receive her notebook. The Communicator of the Haibane Renmei meets with a member of the Toga. In another series, these strange rules and organizations might hint at some sort of dark plot or grand conspiracy; something that the heroine Rakka would inevitably uncover, sending Glie into an uproar as the status quo is upturned. But nothing of the sort happens here. Rather, both the Haibane and the humans are largely content with their confined lives, coexist peacefully, and never have reason to question either the Toga or the Haibane Renmei. 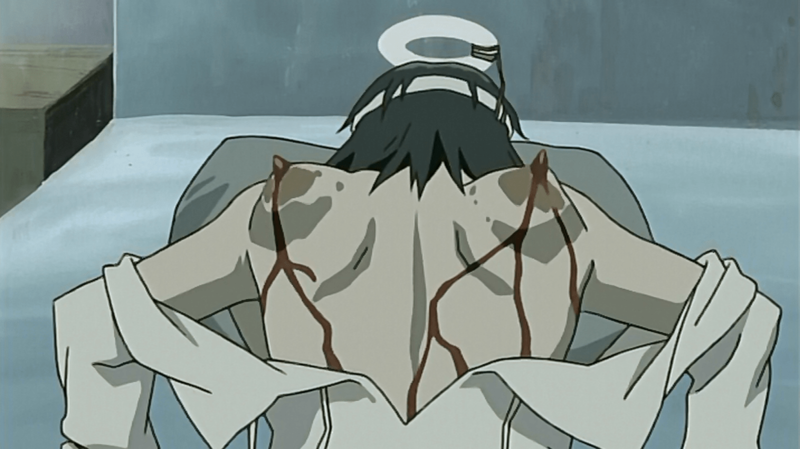 In fact, the first half of the series feels more like a quiet slice-of-life show; as Rakka becomes acquainted with the town, she experiments with the various jobs of her friends and fellow residents of the abandoned dormitory Old Home, so that she too might find work and become a “true” Haibane. Where the mystery comes in becomes evident as one of Old Home’s residents wanders off into the western woods, never to return. There comes a time in each Haibane’s existence known as the “day of flight”; the day that the Haibane simply disappears when no one is looking, and vanishes into parts unknown. Not long after, a distraught Rakka discovers her wings are turning black. The drama that ultimately drives the second half of the series is focused almost entirely on Rakka’s struggles to understand what’s happening to her, and what is to become of her. Is she sick? Had she done something wrong? What happens to those that take the day of flight? And will she ever be able to understand the meaning behind the half-remembered dream from her cocoon? Little black spots like this only signal that worse is to come. The other character given a central focus is Reki. One of the senior members of Old Home, her job involves taking care of the Haibane that come into the world as young children. She likewise serves as Rakka’s caretaker, easing her pain when her wings grow, helping her cope with her blackening feathers, and serving as a guidepost for her when she needs one. But Reki is also very quiet and secretive about her past, and she spends hours alone in her studio, painting. Underneath her calm exterior, there’s something that troubles her; something that only Rakka may help her resolve. The true strength of Haibane Renmei is in its characters and their interactions. Rakka, in her innocence, curiosity, and confusion, comes to meet all sorts of interesting figures, both Haibane and human, that help her find her place in her enclosed world. Her journey is alternately charming, heart-wrenching, painful, and heartwarming, and it’s one she wouldn’t be able to take if it weren’t for everyone she meets along the way. Reki often seems easy-going, but she hides a great deal of her own pain away. Haibane Renmei is also a beautiful work to behold. The character designs, also created by ABe, are distinctive, diverse, and detailed; the Haibane of Old Home especially stand out with designs that each match their respective personalities. The city of Glie and its surrounding outskirts are also well-designed, with an atmosphere that mixes older European architecture with more modern amenities. In turn, Kow Otani’s soundtrack is also a perfect match. Each song feels tuned with the scenes they play against and add to the overall atmosphere, heightening the experience. The show’s ending theme in particular matches the tone of the series as a whole, sounding at times both somber and uplifting. Haibane Renmei may not be flashy or outsized in any way, but there’s a great deal about it that feels very intimate and personal. As the mysteries are solved and the nature of the series becomes clear, the answers are worth reflecting on. Preferably during a second viewing, or even a third. The series paints its subject matter with a deft hand, and like the memories of a newly hatched Haibane, shouldn’t be forgotten. Haibane Renmei was released on DVD in North America by Geneon Universal in conjunction with Funimation. The DVD release features both the original Japanese language with subtitles and an English dub. The series is rated TV-14, with tobacco use and some mild depictions of blood.